The Litter-Robot gently and quietly separates the waste clumps from the clean litter by frequently rotating the globe along a horizontal axis. The clean litter stays in the globe while the waste drops to a disposable bag held in a concealed chamber under the globe. In addition to zero need for manual cleaning and maintenance, there are no rake mechanisms that can get jammed or clogged. The Litter-Robot is a reliable, automatic self cleaning cat litter box that consistently works for every use. The Litter-Robot waste drawer is designed to fit a variety of liners. Inexpensive 30- or 50-litre kitchen garbage bags, and even larger plastic grocery bags will do the job. If you’re seeking a biodegradable option, we offer custom-fit Waste Drawer Liners, in various size packs. It’s up to you! We want this product to make your life easier, without any gimmicks or hidden costs. The Litter-Robot accommodates a wide variety of clumping clay cat litters. Litter crystals, pearls, and biodegradable types are all compatible with the Litter-Robot. Experience and actual use tells us that some brands are better than others for moisture absorption, dust content, odour control, and more. We know you have a favourite cat litter for your pets, so we want to avoid any additional costs or a change in your routine—other than freeing you from scooping cat litter! The concealed Litter-Robot waste drawer was designed to prevent mould growth, thereby controlling and nearly eliminating that telltale litter box smell. Waste is still waste, so we recommend emptying the waste drawer once every 7-10 days for a single cat household. Additionally, the use of clumping litter helps with litter box odour control. The encapsulated clumps, hidden waste drawer, and carbon filter system go above and beyond isolating the waste and litter box odours. To claim that the Litter-Robot is like a breath of fresh air might be pushing it, but many of our customer testimonials have said exactly that. We are certain that the air in your home can and will smell much fresher and far less like a litter box with the Litter-Robot. The Litter-Robot operates at a safe voltage level of 15 volts DC (adaptor included). There are no moving parts, sharp objects, or electrical wiring inside the globe that could harm your cat. A safety mechanism prevents the Litter-Robot from operating when a cat is inside. As an additional safety feature, the globe rotates very slowly, but efficiently, during the cleaning cycle. If your cat tries to re-enter during the cleaning cycle, the motor will shut off automatically. The spacious globe provides a large litter bed area for your cat. The Litter-Robot III Open Air accommodates cats as small as 5 pounds and as large as, well, you tell us! With the enlarged entryway and set-back rotation system, our customers report that as large as 30 pounds have used the Litter-Robot III Open Air .If you are unsure whether your cat is an appropriate size for the Litter-Robot, check out our Frequently Asked Questions. We aim to reduce as much environmental impact as possible. The Litter-Robot standard litter efficiency and compatibility with biodegradable cat litters make this a litter box that you can brag about! We aim to reduce our environmental impact as much as possible, from manufacturing to end user. The Litter-Robot is a home appliance that no pet parent should live without! It is designed for quality and will provide you with reliable, trouble-free service and requires very little maintenance. Solid construction and industrial-grade components ensure a long life, maybe even the nine lives of your cat. But in the unlikely case that your cat doesn't take to the Litter-Robot or there is a defect, you are protected by our 90-Day Money-Back Guarantee and 18-Month Warranty. Cat Evolution stands behind the Litter-Robot automatic self-cleaning litter box with an 18-Month Warranty. During the warranty period, if you have an issue with your Litter-Robot, just ship it to us and we will repair or replace it at no charge. Try the Litter-Robot in your home and experience for yourself the freedom from litter box scooping. You are protected by our Money-Back Guarantee. If you or your cat are not completely satisfied with the Litter-Robot for any reason, simply send the unit back within 90 days to receive a refund of the purchase price. Your only financial risk is the return shipping cost which will be approximately $50.00 to $100.00, depending on your city and state. Customer Service is available, Mon-Fri, 10AM– 8PM AEST 1300 350 635 or email sales@catevolution.com.au. The Litter-Robot knows when your cat is inside the unit and when it's time to clean up. Once your cat exits, a timer counts down allowing litter to clump before a cleaning cycle begins. As the globe slowly rotates, the patented sifting system separates the clean litter from the clumps, and drops the waste into a carbon-filtered drawer in the base. The globe returns to the home position, leaving a clean, level bed of litter for the next use. Empty the waste drawer and add litter as needed. It's that simple! The Litter-Robot's automatic movement relies on the cat sensor, a weight-sensitive switch that detects when your cat enters or exits the unit. At any time, when weight greater than 2.2 kilograms is detected within the globe, the globe will not move, or if the globe is already moving, it will stop. You can stop a cleaning cycle by pressing any of the three buttons. After pausing the cycle, you can abort it completely by pressing either the Empty or Reset buttons. The cat sensor does the work for you and keeps your cat safe. With the Litter-Robot, maintenance is easy and infrequent. We recommend emptying the waste drawer once every 7-10 days for a single cat household, and more often if you have multiple cats. The Litter-Robot III Open Air waste drawer is equipped with infrared emitters and sensors that detect the level of waste after each cleaning cycle. When the waste drawer is full, the blue light on the control panel will flash, indicating it's time to empty. You can use kitchen garbage bags, large grocery bags, or Litter-Robot custom-fit, biodegradable Waste Drawer Liners to line the waste drawer. Simply slide out the drawer, gather the old bag, and discard it. Open a new bag, roll down the edges, and press them into the tabs on the waste drawer starting at the back. Cleaning your cat's litter box is as easy as emptying the garbage! We recommend checking the litter level each time you empty the waste drawer. Through the entryway, add a few cups of any clumping litter and spread it flat, so it meets the raised fill line inside the globe. You don't need to change out the entire bed of litter. The Litter-Robot's efficient sifting system preserves a maximal amount of clean litter each time it cycles, so you'll find it lasts much longer. Customers often report savings up to 50% on their annual litter costs. Is the Litter-Robot right for your cat? It's easy to decide if an automatic self-cleaning litter box is right for you—we know how much you hate scooping cat litter! But will your cat love the Litter-Robot as much as you? You know your cat best, so here are a few things to help you decide. Remember, you have 90 days to try the Litter-Robot in your home under our Guarantee. Does your cat weigh more than 2.2 kilograms? The Litter-Robot relies on a weight-sensitive switch that detects when your cat enters or exits the litter chamber. Cats that weigh 2.2 kilograms or less will not activate the Cat Sensor and therefore should not use the Litter-Robot in Automatic Mode. Instead, we recommend a "semi-automatic" mode (see our FAQ section) to keep your cat safe and relieve you from litter box scooping. 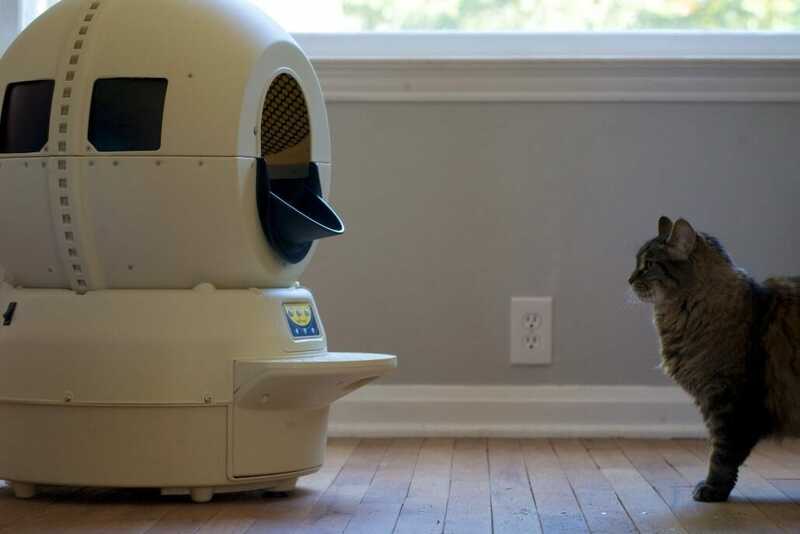 The Litter-Robot III Open Air, made with larger cats in mind, has an enlarged entryway and litter chamber, making it comfortable for even some of the largest breeds. Diabetic cats can produce very large urine clumps—large enough that they may not fall through the waste port into the waste drawer. Unfortunately, this would prevent the Litter-Robot from automatically cleaning the litter. That said, if the urine clumps are only intermittently above average size, then the benefit of the Litter-Robot's automatic cleaning might outweigh the infrequent times you have to intervene to dispose of the large-size clump. Cats that are skittish, very nervous, or easily scared are not good candidates for the Litter-Robot. They may be too nervous to try something new. Also, cats that do not accept change well, especially elderly cats, may reject a new litter box design. The more experimental and curious your cat is, the more easily he or she will adapt to the Litter-Robot. If you have further questions, please email us at sales@catevolution.com.au or call, 1300 350 635 (M-F, 10am–8pm AEST). While most cats adjust to the Litter-Robot without much coaxing, others might need a little help making the switch. Use these tried-and-true methods to overcome common barriers and facilitate the transition. Avoid startling your cat while it is adjusting to the new litter box. Leave the Litter-Robot switched off until you notice your cat has used the Litter-Robot. Wait about 7 minutes for the waste to clump, then turn it on. The Litter-Robot will automatically perform a cleaning cycle (lasting about 2 ½ minutes), then switch it off again. Continue this "semi-automatic" mode until your cat is comfortable and using it regularly. If your cat seems stuck in his ways, we don't advise the "cold turkey" litter box switch. When you suddenly switch out the Litter-Robot for the old litter box, you're likely to have protest puddles and an unhappy cat. Instead, gradually make the old litter box less desirable by letting waste accumulate. Cats prefer a clean place to go, so this should motivate your cat to try the Litter-Robot. This works well in combination with the treats and catnip method mentioned above. The old litter box looks and smells familiar, so use that knowledge to teach your cat about the Litter-Robot. Gradually move the old litter box closer to the Litter-Robot (if you've placed them in different locations). Then, pour a scoop of the old litter on the new litter in the Litter-Robot, which will smell familiar to your cat. We recommend the bait-and-switch approach mentioned above, eventually removing the old litter box when it is soiled. Cats love empty cardboard boxes! Try covering the Litter-Robot with the original cardboard box. Carefully cut an opening in the side of the box for the entryway and a notch in the bottom to access to the drawer. Leave the Litter-Robot unplugged while covered with the box. Don't worry, you won't have to scoop! Once you notice your cat has used the Litter-Robot, wait about 7 minutes for the waste to clump, then plug it in. The Litter-Robot will automatically perform a cleaning cycle (lasting about 2 ½ minutes), then unplug it again. Cats are generally curious and tend to investigate new things. Those already familiar with a covered litter box may be quicker to investigate. We recommend placing the Litter-Robot where the old litter box used to be, especially if your cat is fearful of new things. You can remove the old litter box or leave it next to the Litter-Robot for a short time. Then, take a cup of litter from the old box and put it in the globe of the Litter-Robot. The scent will be familiar, and your cat should be inclined to check it out. Once your cat ventures inside and feels the litter under his paws, he'll know what to do! Check out Making the Switch for more tips and tricks. Can kittens use the Litter-Robot? It depends how much your kitten weighs. The Litter-Robot senses the weight of your cat to know when it enters and exits, which triggers the countdown timer and cleaning cycle. Kittens and small cats that weigh less than 2.2 kilograms may not be heavy enough for the sensor to detect. Until they weigh enough, we recommend using your Litter-Robot in "semi-automatic" mode to keep your cat safe and relieve you from litter box scooping. For "semi-automatic" mode, leave the Litter-Robot switched off or unplugged. When you see your cat has used it, wait about 7 minutes for the waste to clump, then turn it on/plug it in. The Litter-Robot will automatically perform a cleaning cycle (takes about 2 ½ minutes), then turn it off/unplug it again. Continue this supervised, semi-automatic mode until your kittens have gained sufficient weight to activate the cat sensor. No, the Litter-Robot does not have a weight limit. Size and weight often have little to do with whether a cat will adopt the Litter-Robot or not. When we describe which Litter-Robot model is best for cats of a certain size, our recommendation is based on the size of the globe (litter bed area and height of internal space) and the size of the entryway. Our definition of a small cat is 2-5 kilograms; medium cat is 5-7 kilograms; large cat is 7-10 kilograms; and extra large cat is any cat that weighs more than 10 kilograms. Again, the Litter-Robot does not have an upper weight limit, so whether or not the Litter-Robot will be comfortable for a large or fat cat is up to the individual. The Litter-Robot Open Air was made with larger cats in mind. It has a larger entryway and expanded litter bed area to accommodate larger cats. At first, we recommend placing your Litter-Robot near your cat's old litter box. As soon as your cat starts using the Litter-Robot regularly, remove the old litter box. At this point, the placement is up to you. Because the Litter-Robot reduces almost all odor, prevents litter tracking, and has an 8-hour sleep setting (when it will not cycle), you can place it in virtually any room in the house without disturbance. If you decide to place it out of sight, set a reminder, so it's not out of mind! 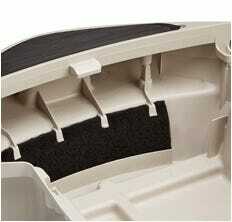 You'll need to change the waste drawer liner about once every 7-10 days (with one cat) and add litter as needed. My cat won't use it. What should I do? Just for cases like this, we have compiled a list of tips and tricks to help your cat make the switch to the Litter-Robot. If you have tried these things and your cat still refuses to use the Litter-Robot, don't worry; you are protected by our 90-Day Money-Back Guarantee. If you and your cat are not completely satisfied for any reason, just return your Litter-Robot within 90 days of receipt for a refund of the purchase price, less shipping. The Litter-Robot works well with almost any clumping or scoopable litter. Litter beads and crystals that are small enough to pass through the screen will also work. We suggest Cat Evolution Premium Clumping Litter . Will the Litter-Robot eliminate all litter box odour? No, the Litter-Robot will not eliminate all litter box odour. However, because waste is promptly removed and contained in the base, typical litter box odour will be reduced significantly. Additionally, a large carbon filter located in the front of the waste drawer absorbs odours and moisture to discourage mould growth (a major culprit of that telltale litter box smell). The amount of odour control the Litter-Robot will provide depends on the amount of odour created—by how many cats use it, what type of litter you use, and your cats' diets, among other things. Of course, the more often you empty the waste drawer, the less opportunity there is for odour to escape. That said, if you empty the waste drawer and notice the Litter-Robot is still a source of unpleasant odours, we recommend changing out the bed of litter completely, deep cleaning the Litter-Robot twice per year, and replacing the carbon filter and seal strips as needed (available here). It is also worth noting that scented litters are generally not as effective at absorbing odors as unscented litter. Instead, we recommend an unscented, odour-trapping, natural litter like Cat Evolution Premium Clumping Litter. How often do I need to empty the waster drawer? It depends on how many cats use the Litter-Robot, how big they are, and your personal preference. On average, for one adult cat, it is typical to empty the waste drawer once every 7-10 days; for two adult cats, you may need to empty the waste drawer up to two times per week. Check out this infographic for more information. The Litter-Robot Open Air is equipped with infrared emitters and sensors that detect the level of waste in the drawer. A light on the control panel will come on to alert you when the waste drawer is full and needs to be emptied. I have more than one cat. Can I use one Litter-Robot for multiple cats? Yes! Multiple cats can use the same Litter-Robot—and each one will have a clean place to go each time, thanks to the automatic cleaning cycle. More cats means more waste, so make sure to empty the waste drawer more frequently. Use this infographic to learn how many units are best for how many cats. If one of your cats is a kitten or may not weigh 2.2 kilograms, be sure to leave the Litter-Robot switched off or unplugged. When you see your cat has used it, wait about 7 minutes for the waste to clump, then turn it on/plug it in. The Litter-Robot will automatically perform a cleaning cycle (takes about 2 ½ minutes), then turn it off/unplug it again. Continue this semi-automatic mode until your kitten has gained sufficient weight to activate the cat sensor. See Can kittens use the Litter-Robot? above for more information. Does the Litter-Robot require special garbage bags? No, the Litter-Robot does not require special bags or liners for the waste drawer. As long as it fits, you can use it. Customers often use 35 to 50-litre kitchen garbage bags or large plastic grocery bags. If you're looking for an eco-friendly option, check out our custom-fit, biodegradable Waste Drawer Liners in various size packs (three come free with each Litter-Robot). What happens if my cat tries to enter the globe while it is rotating? The Litter-Robot will stop immediately. The cat sensor will detect your cat (by weight) and turn off the motor. It will wait 15 seconds, then attempt to resume the cleaning cycle. If your cat or something else is still tripping the cat sensor, the Litter-Robot will not resume the cleaning cycle and a series of lights will flash indicating the problem. The Instruction Manual will help you troubleshoot common problems and our Customer Service team is here to help when you need it. Will the globe turn while my cat is inside? No, the globe cannot turn while your cat is inside. The cat sensor is tripped any time a cat enters or reenters the globe, resetting the timer for another 7 minutes, thereby preventing a cleaning cycle from starting while your cat is inside. See How It Works for more information. Are there any rakes, obtrusions, or wires inside the globe that may injure my cat? No. The globe does not contain any mechanisms or wires that could hurt or harm your cat. 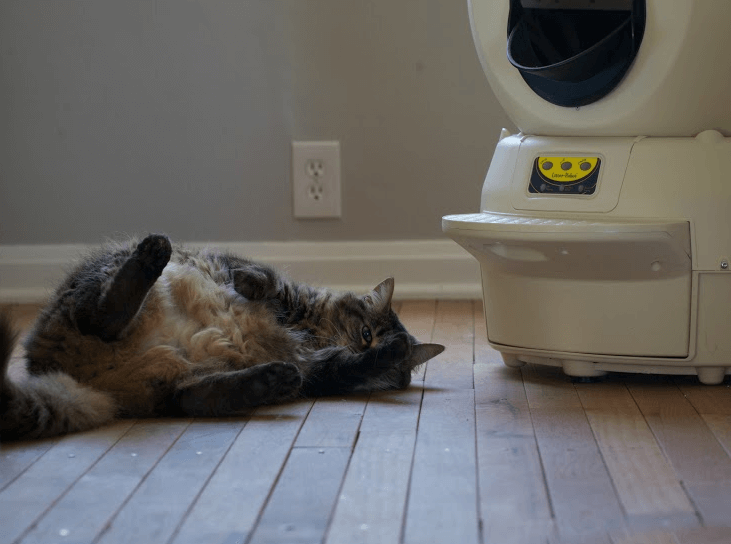 The Litter-Robot was designed with your cat's safety mind. Are the electronics or power source dangerous to my cat? No. The Litter-Robot operates on 15 Volts DC using a wall plug adapter similar to the adapters or chargers that you may use at home, including your cell phone charger. Unlike some other automated designs on the market, the Litter-Robot 15 Volt DC control system components are concealed inside the base of the unit (under the globe), unreachable by your pet. There are no electrical components or shock hazards inside the globe. What happens if the globe jams? If the globe jams, the motor will stop all rotation and the red and yellow lights on the control panel will flash. To fix, turn the Litter-Robot off, then on again. If the jam persists, call Customer Service at 1-877-250-7729. The Instruction Manual will help you troubleshoot common problems and our Customer Service team is here to help when you need it. Is dust a problem with the movement of the litter? Not at all. In fact, dust is virtually eliminated. The slow rotation of the globe combined with the size of the filtering screen results in minimal agitation of the litter. We often hear from customers that this is one of their favourite things about the Litter-Robot: freedom from scooping means freedom from inhaling dirty dust! How much power does the Litter-Robot consume? If you're worried about going from a human-powered litter box to an electric one, don't be. The Litter-Robot consumes a very small amount of power. Based on the Open Air, when the motor is working to rotate the globe during a cleaning cycle, the Litter-Robot uses just 2.7 Watts of electricity. When the Litter-Robot is on standby, which is 99% of the time, it uses just 0.36 Watts of electricity. Cat Evolution accepts Visa, MasterCard, American Express through the Commonwealth Bank secure payment gateway, and PayPal. We do not accept checks or money orders.